With the prospect of a total washout this Labor day weekend from the remnants of Hurricane Issac, I gathered my gear and stashed it in my truck before heading off to work today. This way I have a bit of a head start on my trip over to the Oxbow. I was hoping with this low pressure system pushing North that some of the migrants will stick around and I could catch them at the Oxbow. Despite this sound reasoning the shore birds at both locations were pretty lack luster. Except for 2 lone fishermen the Oxbow was practically empty. Birds were distant and getting close only spooked them off so trying to get any kind of picture was impossible. I’ve come to the conclusion that I know what I’m capable of when it comes to digiscoping, and I’m not going to put just any picture on the blog if it’s not acceptable by my standards. Oxbow Lake and Jackpot Pond were the 2 bodies of water I was most interested in today. Jockeying to get the bird-mobile close enough to where the birds were congregated can be difficult at the Oxbow, and with only a few pull-offs it means for the birder hiking in to get closer to the choice birds. Being tired from a full day work and with my knee bothering me a little I opted to keep the longer walks to a minimum. The fact that you can drive through the Oxbow is what makes it attractive for me. Drive a little, pull over if you see something good, then jump back in to drive to the next location. And when you exit from the Oxbow you’re right next to one of those Indiana casinos and a nice overlook to Jackpot Pond. Leaving the Oxbow I made my way back into Ohio to Lost Bridge. It was here that I ran into 3 birders I knew who were on their way back from Goose Pond and stopped for a quick go over before heading home. Lost Bridge was pretty much a flop. I was able to spy some Peeps in the distance but not much of anything else. The day was wearing on, and I was worn out, so it was time to quit and head for the barn. Located at the confluence of the Big and Little Walnut Creeks, within both Franklin and Delaware Counties is Hoover Reservoir. Completed in 1955 as a source of water for the city of Columbus this 2,818 acre reservoir is 8 miles long and 1 mile at it’s widest. At the far Northern end of the lake sits the small hamlet of Galena. It’s at this location is where the Hoover Reservoir Boardwalk begins. Looking back towards the boardwalk entrance. This area of the lake is the shallowest and with the recent drought conditions the water level is very low. So normally the boardwalk extends out into the lake, however now the boardwalk stretches out over some beautiful mudflats, and some outstanding shorebird habitat. Jon and I took the afternoon off and made the 2+ hour drive to try and locate a life bird that both of us needed, the Buff-breasted Sandpiper (Tryngites subruficollis). For the past several days there have been pretty reliable sightings at this location and being relatively close to home (driving to Lake Erie is not an option) a road trip was in order. Completed in 2005, the 1,500′ long boardwalk is quite a sight as it juts out into the shallows of the lake. As we pass birders returning to their car we’re encouraged by the news that the “Buffies’ were still there. Not wanting to look too eager to get to the end of the boardwalk and set up our scopes. In this picture you can see the short grass all around the boardwalk, where normally water sits. This is ideal Buff-breasted Sandpiper habitat. Another couple were at the end, so when I asked them where the birds were, they weren’t to sure. They were looking at something else and took their eyes off of them for a moment. So we all started to look for them. Being a small sandpiper at 8.3″, and foraging for food in grass that’s not too tall, we finally spotted one, then another, then another. All told we identified 6 individuals. This was a slam dunk. A absolutely beautiful bird. Soft buffy coloration on the head and breast, with a bold patterned back. With a small head and a beady eye, they remind me of a Upland Sandpiper. Another successful afternoon, and a new “Lifer” for both of us. Description:ADULT SUMMER Has mainly pale gray back and upper wings, black cap, and otherwise white plumage. Legs are orange-red and bill is orange-red with black tip. In flight, note dark trailing edge to otherwise white primaries (lack dark “wedge” on Common’s inner upper primaries). ADULT WINTER Looks pale overall, except for dark “mask” through eye, black bill, and darker primaries (especially margins). 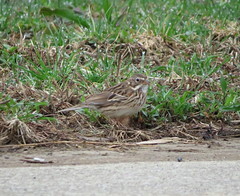 JUVENILE Similar to winter adult, but with buff feathers on back, upper wing, and crown, pale-based bill, and shorter outer tail feathers; first-winter is similar to winter adult but with shorter outer tail feathers. Habitat: Breeds in marshes, generally with lots of open water and large stands of island-like vegetation. Winters in marshes, coastal beaches, lakes, and rivers. Nesting: 1-6 Olive to Buff colored eggs with numerous small spots or blotches of dark brown. Nest varies from unlined scrape in mud or sand, to elaborate raft of floating vegetation, or on top of a muskrat lodge. Typically placed in clumps of marsh vegetation close to open water. 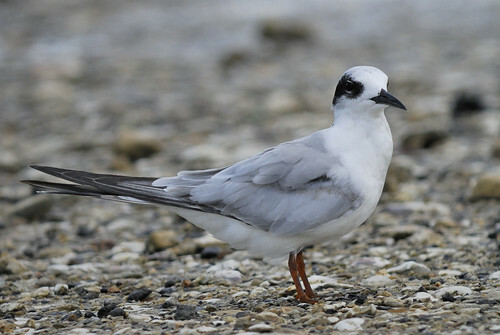 Forster’s Tern is the only tern restricted almost entirely to North America throughout the year. Spawning common carp are so vigorous that they can dislodge Forster’s Tern eggs from floating nests. Forster’s and Black terns breed near each other in marshes. Wandering semi-precocial young may account for observations of each species feeding the other’s young. I love last minute, unexpected, spur-of-moment, road trips. However when Buff-breasted Sandpipers are within a 2 hour drive from home you have to make the decision on whether to go or not. WE GO! For the past several days they’ve been seeing multiple “Buffies” at Hoover Reservoir Northeast of Columbus, and neither Jon or myself have this particular bird on our life list. We’re hoping to remedy this problem tomorrow after the delivery people bring my new washing machine, which already screws up an early departure. I’ve just finished putting the finishing touches on my new page, a photographic bird album. So if you glance across the header you’ll notice right between “New List Birds” and “Yard List” my new page. I’m not a professional, or rank amateur when it comes to capturing the perfect image, however even a blind squirrel… So remember to return often as more and more pictures will be added that I deem worthy. So I hope you enjoy it, and if you do drop me a comment, because feedback is always welcome. I’m sure I’ve mentioned in the past the difficulty in locating new life birds for myself in the Greater Cincinnati area, and this problem still plaques me, that’s until today brought me some luck and a much needed new bird. A local birder posted this morning from Lost Bridge that while checking out the ever expanding mud flats under the bridge, he was unable to re-locate the Baird’s Sandpiper seen the day before, however he was able to spot a Red-necked Phalarope. And once again I started to get that twitch and all I can think about is hitting the road. Lost Bridge is an hour away from home and with rush hour traffic that estimate could easily double. And to top it off I had to run to the grocery store and pick up a few necessities. So even with all these obstacles I arrived at Lost bridge at 5:00 pm, and no other birder in sight. I thought this odd considering the turnover of birds in this location especially during migration. Oh well, I’ll give myself high 5’s all around on my new life bird. The smallest of the 3 species of Phalarope’s, the Red-necked Phalarope measures at 7 3/4″ (20 cm). 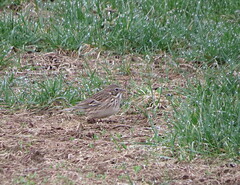 This picture was taken quite a distance away and heavily cropped. And if that wasn’t enough I was also able to re-locate the American Golden Plover, and since he was a little closer I was able to get a decent picture. And then to top it off I was able to get some very good looks at a Stilt Sandpiper. I’ve only seen one other one and that was a couple of years ago at Treaty Line Road mud flats at Brookville Lake. 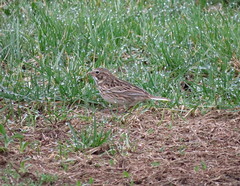 Today I was a little closer, and to be able to look over the field marks of this bird really helps. I was only at Lost bridge for about an hour, and it was worth it. The Baird’s Sandpiper will have to wait for another day, and despite that I have one on my life list already, I’m not too sad. It was a very enjoyable drive home.